Toyota Kirloskar Motor recently introduced the Camry Hybrid Electric Vehicle in India. 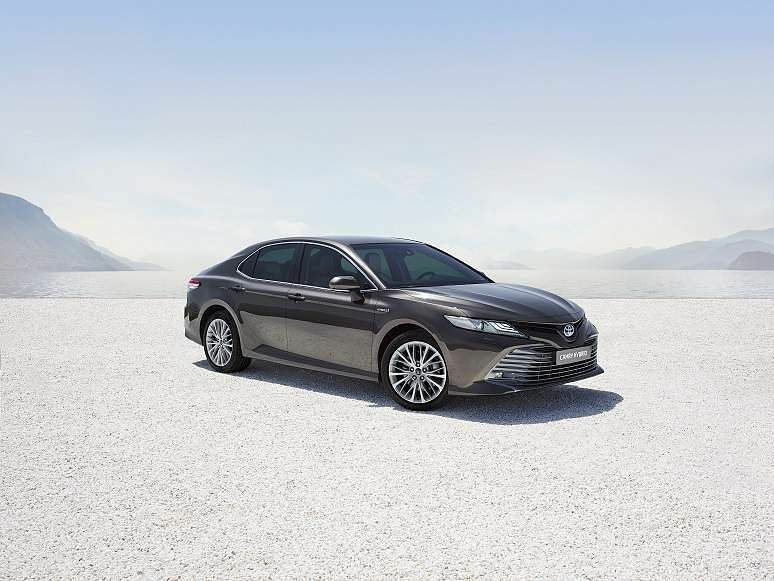 This is a fresh vehicle that is built on Toyota’s new global architecture and it promises to offer a powerful, luxurious, and efficient drive experience, thanks to its unmatched engineering. The new model boasts a sharp design language that looks rather futuristic. Despite its size, the car has been crafted to be rather proportionate and its low wide stance gives it a nice sporty touch as well. Its front portion is characterised by a two-grille design, large LED projector headlamps, and fog lamps and those LED daytime running lamps add a neat touch too. It also gets a moon roof, rear combination lamps, and it sits nicely on 18-inch multi-spoke alloys. Being a car that is often used as a chauffeur-driven ride, the comfort level on this automobile is touted as the best in its segment. The interior has been crafted from the finest materials that include metallic accents, soft leather upholstery, and Onyx garnish. It also gets a range of advanced features that include the three-zone climate control, ventilated front seats, a 10-inch heads-up display, memory settings for the driver’s seat, interior illumination, a wireless smartphone charger, steering-mounted audio controls, cruise control, and rain-sensing wipers. The infotainment system comes with an onboard navigation service and personalised assistance and you also benefit from a nine-speaker JBL audio system. Toyota has always taken safety very seriously and the new vehicle doesn’t disappoint on this front. You get nine airbags, ABS, EBD, brake hold function, vehicle stability, and traction control, park assist, speed-sensing door locks, a tyre pressure monitoring system, ISOFIX/top tether anchors for the children’s seat, and an impact-sensing fuel cut-off to avoid fires. Undoubtedly, it is a rather secure place to be. Offering a mileage of 23.27 kmpl, thanks to the hybrid drive, the new Camry is reportedly the most frugal vehicle in its class. On board, you get a 2.5-litre, 4-cylinder petrol hybrid Dynamic Force engine that delivers 178 PS of power and 221 Nm of torque. The hybrid motor delivers 120 PS of power and 204 Nm of torque and is a self-charging unit that seamlessly uses both modes to ensure a great driving experience. The 4th generation Toyota Hybrid System uses advanced Nickel-Metal-Hydride batteries that are said to be long-lasting. The drivetrain is paired with a CVT and comes with paddle shifts on the steering. The Toyota Camry Hybrid is priced at `36.95 lakh (ex-showroom pan-India). Launch: The new Range Rover Evoque can wade through 600 mm of water!